We left off with our two day crazed wedding search leaving us fairly defeated. With Muskoka becoming a destination wedding location, the costs were high and nothing was fitting into our vision. I'll admit that at this point in our search, I was beginning to believe the wedding wasn't worth it. What was the point if nothing felt right? Instead of excitement and celebration over our engagement, I was already in a wedding planning funk. As someone who was dreaming of the days when I could finally plan our wedding, I was feeling pretty disappointed by this road block. Two days after our engagement and no viable location options in sight*, I went for a little walk to clear my head on our property. This is a pretty typical practice. 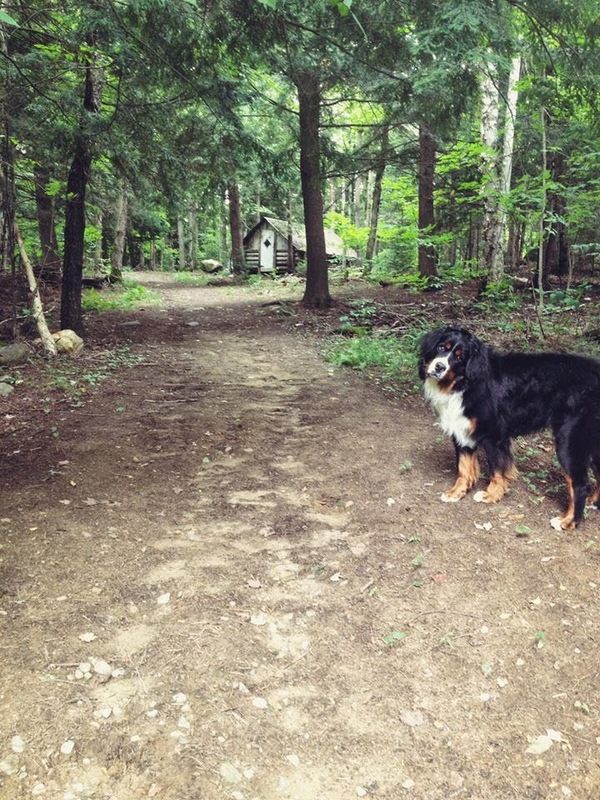 Since I work from home, I will often grab Nelson and just go for a walk in the bush. Mr. Narwhal was up in our chicken coop tending to our laying hens (yup, we have chickens!) and I walked up the path through our little forest wishing that our property could be a viable option. When we first moved into our home in December 2013, I had mentioned the idea of getting married on our property to Mr. Narwhal. He loved the idea, but somewhere over the course of the nine months between then and our engagement, the idea had been pushed aside thinking it would be too much work. As I looked around our beautiful forest seeing how our vision could come together. I was picturing the trees lit up with lights and candles and our little cabin as the perfect backdrop for the ceremony. A few steps behind me Mr. Narwhal (he kind of snuck up on me) started talking about where we could drop trees, set up the tent and how it could all work. I started getting really excited. Mr. Narwhal: "Did we just decide to get married here?" Me: "I think we did!" We discussed the date (that I already had in mind) and we hugged it out. I called my mom and announced the big decision, and told her to save the date! Making this decision felt like a huge weight off of my shoulders, and I immediately returned to my post-engagement bliss and entered my ultra planning mode fuelled by ideas and major excitement. Did you venture down the road of planning a wedding on your property? *I realize two days might not seem like a long time but for someone lacking patience a non-stop two-day Googlefest feels like an eternity.